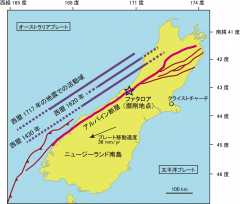 In the Alpine Fault Drilling Project in which Naoki Kato (Ph.D. of Graduate School of Science (Associate Prof. Tetsuro Hirono's Group), Osaka University, currently joining Toshiba Corp.) and his parties participated with support of Japan Drilling Earth Science Consortium, they clarify a large temperature heterogeneity on Alpine Fault plane which is the plate boundary between Australian Plate and Pacific Plate, and the heterogeneity is controlled by the uplift associated with the fault movement and the groundwater circulation by the uplift. The project team measured the underground temperature with a fiber-optic thermometer and the fluid pressure by a hydrological test as important parameters to indicate the strength of fault. As a result, a very high-temperature geothermal gradient, four times the general continental crust, was found. The geothermal gradient of the upper Alpine Fault based on past fault drilling was about twice the general continental crust and a large temperature heterogeneity was found on Alpine fault plane. Their study showed that temperature heterogeneity on the fault plane was estimated by comparing measured temperature and fluid pressure with calculated value, and the heterogeneity was caused by the uplift associated with the fault movement and the ground water circulation by the uplift. The temperature on the fault plane controls the mineralogical composition, and the mineralogical composition controls the strength of fault. Therefore by estimating the temperature heterogeneity on the fault plane, we can clarify the heterogeneity of the fault strength and furthermore the heterogeneity of the slip at the earthquake, and it is expected to be applied to the prediction of the seismic ground motion based on the estimation of the strength distribution. This study has been published in the UK Scientific Journal “Nature” volume 546, 1st June 2017.